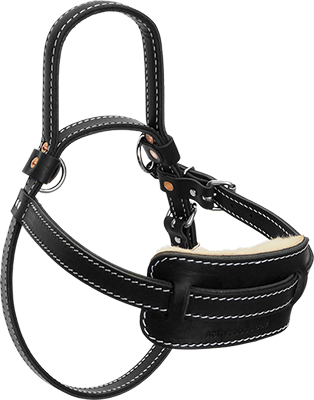 Our quality Guide Dog Harness is made from two layers of soft, supple black latigo leather that are stitched and riveted together. The front chest pad is lined with real sheepskin padding. We have reinforced the two layer handle with a steel bar. This stand-up handle is approximately 5” tall. The chest and girth straps are both adjustable. There are two D-rings on each side for attaching the reflective bridge handle (sold separately). 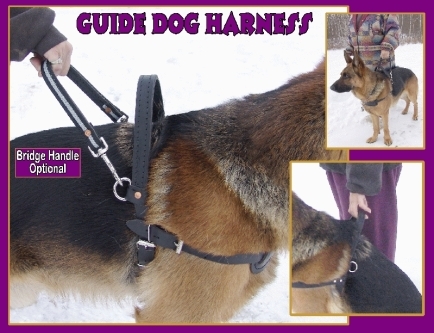 This harness is made for guidance and is not designed as a mobility harness.